I am in the process of rebuilding my tiny trainer after my first two unsuccessful flights. My first flight was brought short by a reversed elevator and second by range issues with the Devo 7e I was using. 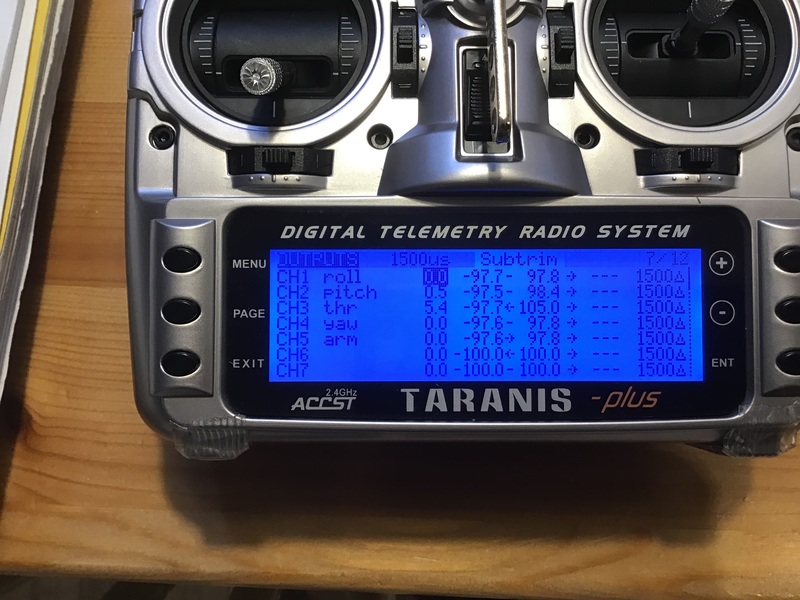 I've upgraded my reciever/transmitter combo to Frsky equipment, so range shouldn't be an issue the next time and I know now how to check for proper movement of the servos now and feel like I'll be in a much better place next time. I've also been flying a Hobbyzone Sport Cub S that my wife got for me for my birthday, which has been super fun. However, I don't know how best to handle the current rudder position. When I re-attached the rudder servo it appears that I did not have the servo centered. This pretty much left me right between two undesirable rudder positions depending on what tooth of the servo I am on. In order to trim it straight (at least visually on the ground at this point), I've got to have the trim all the way to maximum one way or the other on my QX7. What is the best/correct way to deal with this without pulling the servo back off? I have Gorilla Glued (white) it in place, so I don't think that will end well. I was thinking of pulling off the rudder control horn and re-positioning it. How would you go about fixing it? Change your linkage wire. Pulling things out that have been glued in can be a bad idea. It can be done though. I would get a new push rod and a stopper, this way you only have to remove the servo horn to install the stopper. Hook the rod back up, center it, then lock the stopper down. No ugly removal process of main components. I use stoppers everywhere, never an issue centering things. Have know real clue about Open Transmitter but in the menu there should be a place for servo set up. There should be servo travel, sub trim, servo reverse, what you want is sub trim and choose rudder. Once you find sub trim center your transmitter trim then center the servo using sub trim. Once that is done then check your travel so the rudder moves the same amount in both directions using servo travel. I am a Spektrum guy but I know all these menus are in open Transmitter just have to find them, if you had Spek about 2 minutes I could have you all straightened out. You could go with the 1st tooth position then "gently" put a slight "kink" in the wire (where it won't interfere) with a pair of pliers. That might be enough to take up the slack in the wire. It's always best to get it as close as possible mechanically then use the radio to dial it in. Those sound great. Do you have a link for some that would fit appropriately for the tiny trainer? Personaly I don't like bending my control rods at all, I try to run them straight as possible, less chance of any flexing under load. The less bends the stronger they are. Many different sizes to choose from but this is one of the guys I stock . If your Tx has sub trim which I believe it does I'd go with the position on picture number 2 to correct it (seems like it has less of a distance to be fixed considering sub trim has a limit). Linkage stopers are great but I have personally never used them to correct uncentered servos, I try to center them on the plane if I forgot to do that before. I have used what @kilroy07 suggested its refered to as a V or u bend in an accessable spot on the push rod (not much of that on the TT), but I personally didn't like it and prefer the stopers more. And welcome to the family . A simpler solution for this problem is to make the servo position such that it pushes the rudder too far and then with a pair of pliers bend the pushrod in a sort of very shallow "S" or "V". The bend will shorten the pushrod so that the rudder can be centred. If you bend it too far then straighten it a little until the rudder is centred. Do this with the Tx trims all centred and you will never know the difference in the air! You can alter the sub trim on the TX, it’s on the “Outputs” screen in the model menu, the two columns in the centre. Centre the regular trim first. Also in the radio setup put the trim steps level from “fine” to “medium.” That gives you a bit more total movement. Buy not centering your servos you loose resolution in one direction in other words your control surfaces will have more movement on one direction then the other and not at the same rate because of the control arm. Always center your servo before attaching control rods weather you use linkage stoppers or not, then adjust in the radio so travel is the same in both directions. Ailerons using dual servos and not centering servos before control rod installation will add in differential in the ailerons which you may not want. Always try and set up your servos so the control arm is centered with out any radio changes first, if not possible then use radio inputs to center the servo. I use these. Don't go past the 3rd or 4th hole on the servo arm because you will have to enlarge the holes quite a bit. Just go slow and keep it centered and you won't have any problems. Snug the nut down until the stopper doesn't rock but still moves freely on the arm. Might want a tiny drop of locktite on the nut or put a drop of CA to keep the nut from coming loose over time. Any similar size music wire will work. My local hardware store has a good selection and many larger Big Box stores, like Lowes, also carry it. Myself I think the wire in FT kits is too small. I prefer thicker stuff, I use utility or tile marking flags for pushrods. I can get 100 for about $10. One flag will make all the push rods I need for one plane. My stoppers are the type with a nut, they always get a drop of Loctite. Haven't done it myself but I know of some guys using the spokes from old bicycles as pushrods. Yes, spokes work great, they are also threaded on one end, if you want to use a clevis. Some also use straightened paper clips as push rods. I have used welding rod for controle rods.